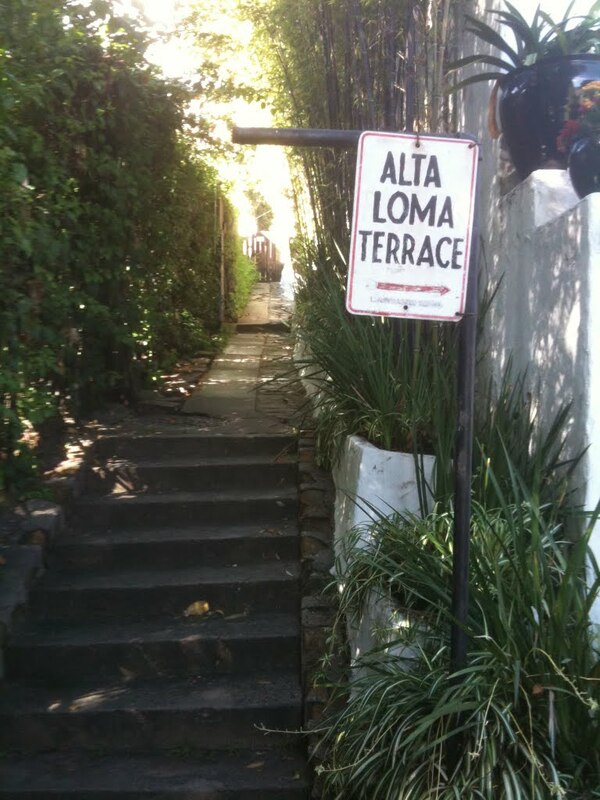 When I went there, I thought that Alta Loma terrace, in Hollywood, CA, was a pretty, rather enviable place to live. Unusually for any residential street in America the houses are arranged on either side of a footpath instead of a road (although reassuringly there’s vehicle access to the rear of the houses) and the path rises steeply up a wooded hillside. Behind thick foliage you glimpse houses in brazenly varied architectural styles, sprinklers, barbeques and well-tended gardens. And between the houses are stunning views over suburban LA and to the hills beyond. It was in a house on Alta Loma terrace at the very end of the 1930s that a hack screenwriter of Russian-Jewish heritage, brought up in New York City, set to work on his fourth and final novel. Nathanael West – born Nathan Weinstein – needed the money he made from screenwriting because his literary career, while earning him plaudits from some reviewers, was not going to keep him afloat. He had come to Hollywood, not, like so many, because he dreamed of stardom, but because the movies paid well, and in Depression-era America that was rare. The novel he wrote in Alta Loma Terrace, The Day of the Locust is often heralded as one of the great literary depictions of Hollywood. Its characters are basically losers. Most are low on the Hollywood food chain – a wannabe star who’s had one line in a movie and said it badly, her ailing dad who once had a moment of fame as a vaudevillian but now peddles furniture polish door to door, a scheming dwarf, an astonishingly stupid cowboy. And… there’s also Homer Simpson. Yes, this is the novel from which the creator of the Simpsons got his goofy character’s name – and maybe some other characteristics come to that. Homer in the Day of the Locust is one of the most pathetic, fragile characters in twentieth century American literature (and there’s a lot of competition). He’s come to Hollywood from the Midwest not to become a star but – like many real-life people have always done – in search of sunshine and a new start. He finds instead a place so shallow and confusing that it destroys him – quite literally in the novel’s extraordinary apocalyptic final scene. 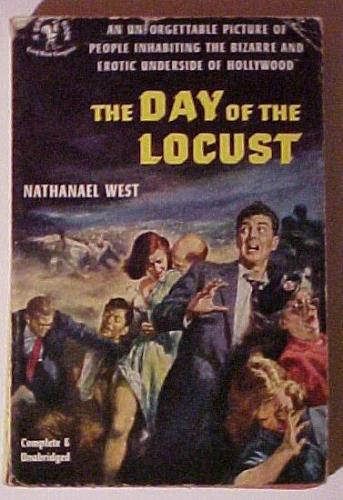 The Day of the Locust is only superficially about the superficiality of Hollywood. Really it is about the emptiness of the American Dream – again, like so much American literature. But what makes this novel especially interesting is West’s astonishing insight into the resentments and frustrations of the people who ended up in this place of dreams. It wasn’t only the dream of stardom that West was satirizing; it was also another, related promise that California held out – the promise of paradise; that in this land of sunshine and oranges you could leave your cares behind and make a fresh life for yourself. His original title was The Cheated. He also toyed with Ship of Fools. And so populating the novel – constantly surrounding the main characters are people who the novel’s protagonist (a painter, Tod Hackett who closely resembles West) calls ‘the people who came to California to die.’ These men and women are the broad American middle class – the people drawn to southern California in the interwar years by images of paradise who found instead… well, many things, but never what they came for. The novel documents the cultish religious fads that served as outlets for frustration. It depicts a nastiness and a grasping at scapegoats lying beneath the surface of a world of leisure and sunshine. In the pastiche architectural styles of this made-up town, (like those still there in Alta Loma terrace), West sees a desperate yearning for drama. Only dynamite would be of any use against the Mexican ranch houses, Samoan huts, Mediterranean villas, Egyptian and Japanese temples, Swiss chalets, Tudor cottages, and every possible combination of these styles that lined the slopes of the canyon. … It is hard to laugh at the need for beauty and romance, no matter how tasteless, even horrible, the results of that need are. But it is easy to sigh. Few things are sadder than the truly monstrous. In a radio documentary produced by the brilliant Phil Tinline, I’ve traced the ways in which West’s understanding of middle class frustration anticipated the politics of the postwar era – in particular the rise of the right associated most of all with Richard Nixon and Ronald Reagan, two men who, as Phil realized, were both living within a few miles of West when he wrote The Day of the Locust. Reagan was there, of course, because he wanted to be a star. Nixon was there because he was born there – or at least about 25 miles away – a man fascinated by Hollywood (as Mark Feeney has shown in Nixon at the Movies) but always on the outside. Nixon married a movie extra who he met doing amateur dramatics; he understood the power of acting, but was doomed to be awkward in his own skin. Reagan, under-rated as a B-movie actor, actually proved himself in his greatest acting role as a politician. He may have been among the Hollywood glitterati, but he understood the frustrations of those who were not. The American Dream is that hard work leads to a better life. Nixon and Reagan would go on to channel the resentment of those who felt that this was no longer true — and, especially in Reagan’s case, offer them hope that it might become true again. What Phil Tinline and I argue in our programme is that the resentments that drive The Day of the Locust to its violent conclusion are eerily prescient of the conservative movement that, as historians now realize, did not just emerge from nowhere in the late 60s, but had been growing, especially in southern California, for decades. What West had understood was what might happen when the broad American middle class, people who had played by the rules and worked hard, felt that other people were taking them for a ride. In many ways, America in the 1960s was a very different place from West’s Hollywood, but the sense of frustration West identified was to become a shockingly potent political force. It was Nixon who grasped this. The men and women who voted for him were tax-payers, homeowners, parents. Their sense of middle class entitlement was rooted in a culture of work and reward. And now they felt their world had been cut from under them. And then they voted for West’s old Hollywood neighbour, Ronald Reagan. We think of him as the sunny optimist, but as his successful run for California Governor in 1966 showed, there was a harder side to Reagan’s appeal. In the face of students occupying campuses, and with riots in black neighborhoods in Los Angeles, Reagan cast himself as the enraged tribune of the hard-working, patriotic, middle class. One of the big stories of twentieth century US politics is the story of the politicization of middle class discontent, the feeling articulated by a succession of conservative politicians, that somehow people are losing their country, that there are liberal elites in charge who’ve sold them down the river. 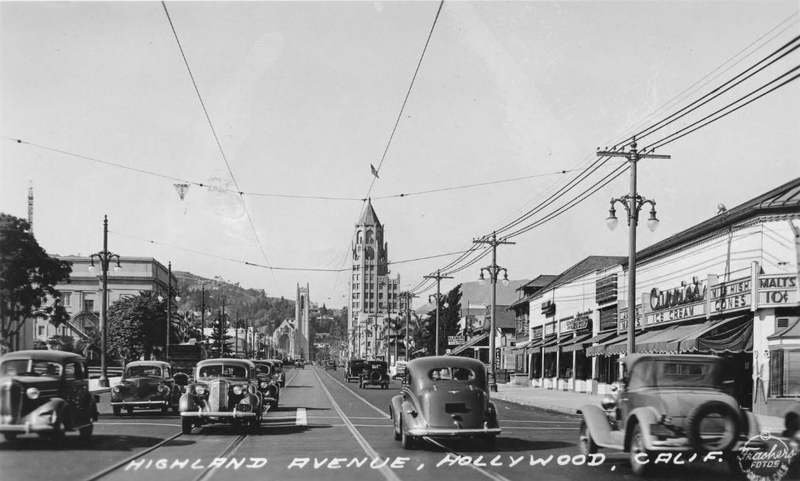 Nathanael West hung out with Hollywood Communists – he shared an office with Lester Cole, one of the Hollywood Ten – but what he understood that they did not was that you cannot explain mass politics only with reference to economics, or class conflict only with reference to material interests. What matters at least as much is people’s sense of being in control of their own fate, or not. The stories people tell about their world – their enemies, their friends, the hidden hand that controls events – are what canny politicians can tap into. Hollywood screenwriters know it too. And so do perceptive novelists. Nathanael West’s strange, disturbing novel is not a work of prophecy in a straightforward sense – but it contains an astonishing intuition of the power of resentment in politics, and an understanding of how the nexus of golden promise and bathetic reality could feed it – as well as of how Hollywood and southern California epitomizes that nexus more obviously than anywhere else. For this, as well as for the more than coincidental convergence of West, Reagan and Nixon on the edge of the great American dream factory, The Day of the Locust is more than a ‘Hollywood novel’ — it helps us to grasp how politics worked in the tumultuous middle decades of the American century.